It's been a busy month at chez Chickhammer. I started a fantastic new job and I've found a new love- the airbrush. A woman has needs, don't judge. 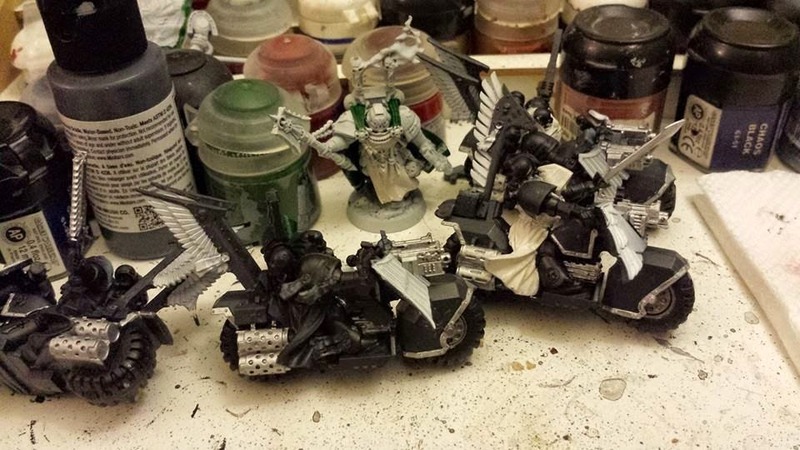 I've been working on a Dark Angels commission (largely Ravenwing Bikers) and the client had an airbrush which he kindly let me borrow. I used it for ten minutes and I was in love. 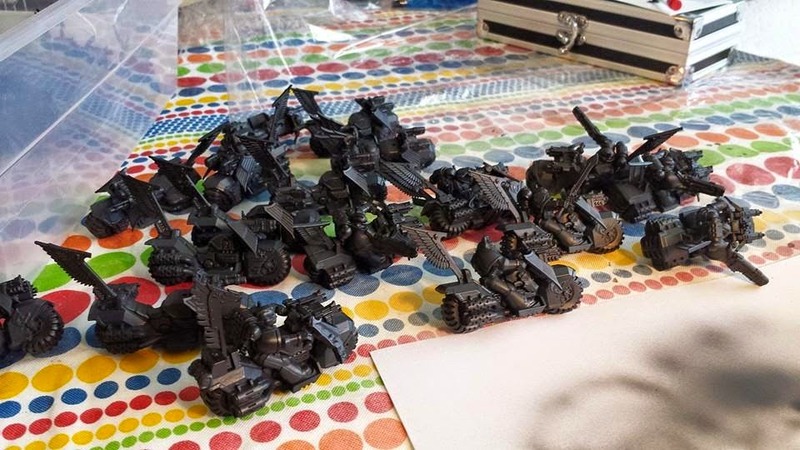 I base coated the entire fleet (I say fleet because there's like 50 of them) in a little over half an hour. I decided to make the bikes a very dark grey and the power armor legitimately black, to create a little bit of contrast. I thought all black everything just looked incredibly flat. The airbrush was immensely helpful in this endeavor. I managed to do all the dark grey and the white with the airbrush, after some masking off at least. Then they were ready to start the brush work. I had a little bit of an issue with overspray with the white, but not nearly as much as I had expected. It's so unfortunate that these are largely Dark Vengeance models, because those jerks are attached to their bikes. Makes it a lot harder to airbrush them. Fortunately, I also have a bunch of Black Knights to do and they are blessedly separate pieces. I've gotten a good bit of them done so far and I can't wait to start working on the Apothecary. Looking forward to the challenge of the white on him. 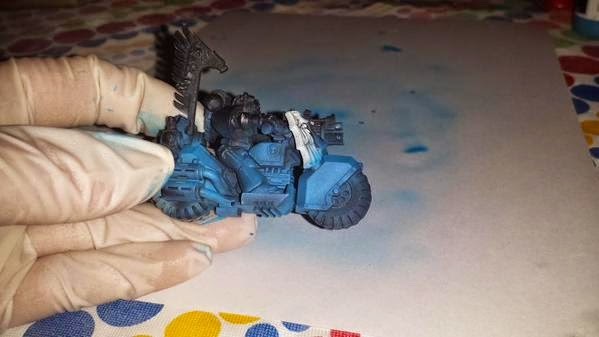 As tools go, the airbrush is amazing. A bit of a diva for sure, but beyond useful. I'm starting to see a lot of blow back towards it, and I'm not sure why. The most commonly stated reason is the over stylized schemes you sometimes see (OSL, super highlighting, etc) but I don't see it as any different than any other styles of painting. I love mine and use it all the time! What kind of brush has you been borrowing? Josh, my guess based on the case in the background of the second picture is a Badger Krome. That is one of the brushes I have, and the case is identical. I think the airbrush is just a tool like any other. As with any artist tools, everyone will always argue what is the best. Guess what? Everyone is right :). It's a Badger Renegade Velocity. I really like it. The speed at which I can base coat alone is worth the price and the cleanup time. I'm really in it for the speed. If I can cut my base coating time in half, then that's more time I can spend on detail work. Badger makes great brushes. They've always been really helpful when I've emailed them questions. Ken (The owner of Badger) is at Adepticon every year doing demos and answering questions (and selling stuff heavily discounted). I've a SOTAR which is a bit overkill for 90% of what I use it for, but I already own it, so... I really want a Patriot 105 for my 'daily' use. 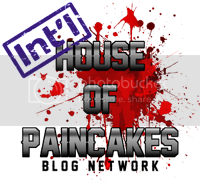 I've had nothing but good experiences with this one, though I've never used any others so I can't really say anything other than I like this one haha.